Welcome to the Math Salamanders' Comparing Numbers hub page. Here you will find online math help and support to help you compare different numbers, including decimals and fractions. There are also links to a range of different ordering and comparing number worksheets which will help your child to understand about comparing and ordering different numbers and quantities. These sheets will complement and hopefully add to your child's knowledge and understanding of place value and the number system. Are you needing to compare numbers to 100, 1000 or 10000? Trying to compare negative numbers? Looking to compare fractions or decimals? This page will help you understand all about comparing numbers and ordering numbers! When comparing numbers, it is important to know the value of the most significant digit in each of the numbers. This will tell you how large each number is. The most significant digit is the first non-zero digit the number has. The number with the largest-valued most significant digit will be the bigger number, unless it is a negative number. In the number 2318, the most significant digit is '2' which has the value 2000. In the number 74.39, the most significant digit is '7' which has the value 70. In the number 0.0825, the most significant digit is '8' which has the value 0.08. If the two numbers are both positive integers (whole numbers) then looking at the number of digits the number has will show you which is bigger. We often use the symbols > < and = when comparing numbers. a = b meas a is equal to (or has the same value as)b. Our easiest sheets look at comparing numbers up to 10. At this stage we use words like most, least, biggest, smallest, equal to, greater than and less than. As well as comparing numbers, we also compare numbers of 'things'. When you are comparing numbers up to 100, you need to look at the value of the tens digit (unless the number is 100). The number with the larger tens digit will be the bigger number, as the tens digit will be the most significant digit. The only exception is if either of the numbers are negative - in which case, look at the comparing negative number section. If the numbers have the same tens digit, then look at the ones digit and see which is more. Looking for some practice worksheets to help you compare and order numbers to 100? When you are comparing numbers up to 1000, you need to look at the value of the hundreds digit (unless the number is 1000). The number with the larger hundreds digit will be the bigger number, as the hundreds digit will be the most significant digit. If the numbers have the same hundreds digit, then look at the tens digit next and see which is more. If the numbers have the same hundreds and tens digit, then look at the ones digit to find out which is bigger. the 1st number has a higher hundreds digit so it is bigger. the hundreds digits are the same, so we look at the tens digit. The 2nd number has the higher tens digit. the 1st number has a hundreds digit, the 2nd number has no hundreds. When you are comparing numbers up to 10,000 you need to look at the value of the thousands digit (unless the number is 10,000). The number with the larger thousands digit will be the bigger number, as the thousands digit will be the most significant digit. If the numbers have the same thousands digit, then look at the hundreds digit next and see which is more. If the numbers have the same hundreds digit, then look at the tens digit to find out which is bigger, and so on. the thousands digits are the same, but the 1st number has a bigger hundreds digit. the 1st number's thousands digits is 7, the 2nd number's is 9.
the thousands and hundreds digits are the same, but the 2nd number has a higer tens digit. The sheets in this section will help your child to practice and master ordering and comparing numbers with 5 and 6 digits. There are a range of ordering and comparing worksheets as well as some challenges for more able pupils to test mastery. The sheets on this page are all about ordering BIG numbers up to 100 million. There are a range of ordering and comparing worksheets as well as some BIG number challenges for able mathematicians. When you are comparing with negative numbers, everything swaps around and becomes a little more complicated! With negative numbers, the more negative the number is, the lower its value. As you go right along the number line, the values are increasing. As you go left along the number line, the values are decreasing. This means that any positive number (or even zero) will always be greater than any negative number. When you are comparing decimals, you need to look carefully at the value of the most significant digit! The most significant digit in each decimal below is marked with an arrow. This means that a decimal like 0.7 is greater than 0.65 because the most significant digit is worth more. Looking for some practice worksheets to help you compare and order decimals? There are 2 different ways to compare fractions: by converting to decimals, and by converting to like denominators. If you have a calculator, you can use Method 1 which is easiest. If you do not have a calculator, then you should use Method 2. Step 1) Take your two fractions and convert them both into decimals by dividing the numerator by the denominator. Step 2) Compare the two decimals to see which is bigger. Which is bigger 3/7 or 2/5? The second way to compare 2 fractions - using like denominators. Step 1) Take your two fractions and convert them both into equivalent fractions with the same denominator. Step 2) Compare the two numerators to see which is bigger. Which is bigger 5/6 or 7/8? 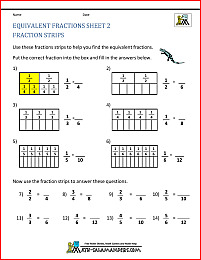 Step 1) Change both fractions into equivalent fractions with the same denominators. We need to multiply the numerator of each fraction by the other fractions denominator. Now that the denominators are the same, we can compare the 2 numerators.